As I was taking a personal inventory in an attempt to answer that question I was tempted to be discouraged but instead God brought me to a realization. Not every faithful act has to be earth shattering. This is where we, or at least I, tend to get hung up. 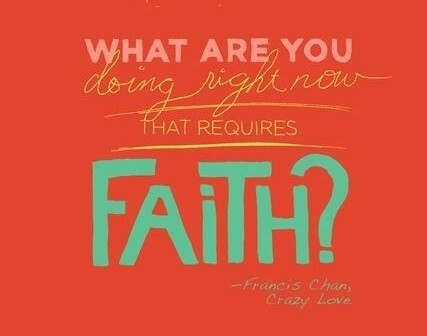 I feel like stepping out in faith needs to be a major act, an all or nothing, jump out of the boat kind of leap. I am a fan of the huge gesture and have always in my own mind paralleled big steps with faith. Neil Armstrong’s famous moon walking words came to mind as I was mulling all of this over. “One small step for man. One giant leap for mankind.” There are definitely seasons in our life when we are called to actions that we feel are great steps of faith. Today though, I want to encourage you, that even those small steps, prayers poured when you feel like you are stuck in place, beseeching and waiting on God’s direction, are indeed faith steps. Inaction is more difficult for me than action. Sitting still when I would rather be running out into the future instead of waiting for God to work it out and bring it to me goes against every fiber of my being and requires every bit as much (I might even say more) faith as jumping out of the boat. Listening instead of talking, sitting instead of running. Doing nothing takes courage; waiting takes faith. Today I would challenge you to answer the question, “What are you doing right now that requires faith?” And realize that your small steps can be turned into a giant leaps when made in faith.